Back end of trailer flashed on top. Insulation in this part of the house will be in raised floor system. Front end of trailer flashed on bottom, with insulation on top. Raised floor system with storage will be installed on top of insulated zone. As the trailer was being designed and manufactured, we opted not to have the manufacturer flash the underside, as it was an additional $600 and we were confident that we could do this ourselves at a much lower cost. While it did cost less to do it ourselves, it was not easy and involved considerable time and trial and error. 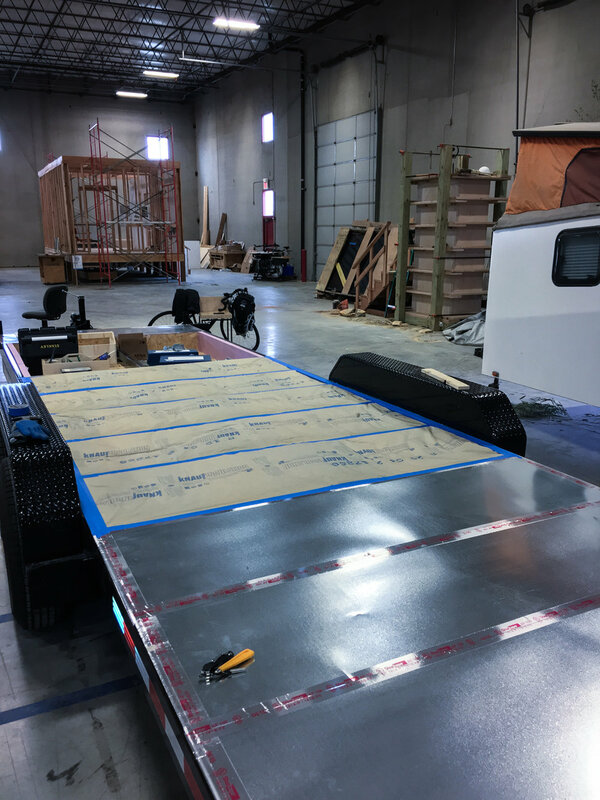 We chose to flash the trailer with galvanized steel sheet metal, purchased in 24" rolls and trimmed down to proper lengths with a straight edge and box cutter. 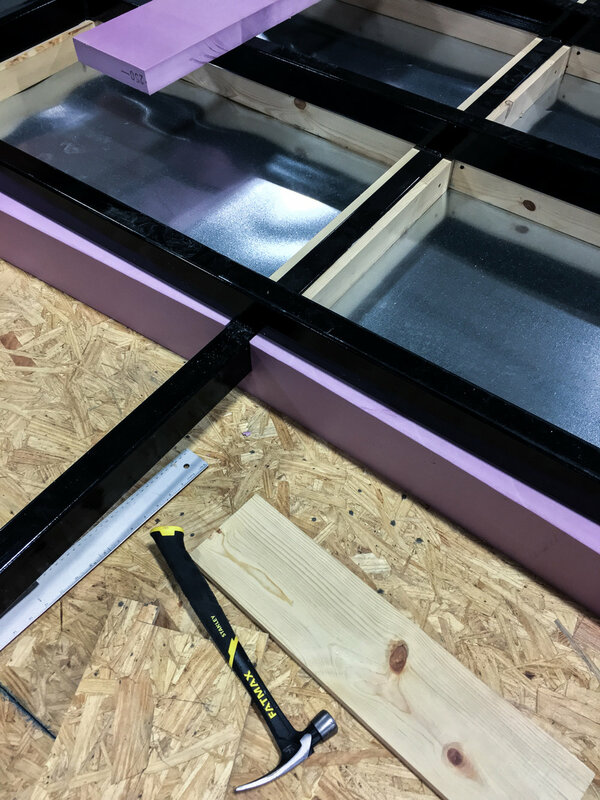 We began by installing a series of timber frames to all internal edges of the steel framing, intended to create a surface to attach the sheet metal with screws, in some places at the underside of the trailer, in some places on the top side. As Kadim began installing sheet metal to the underside of the trailer using only screws, we realized that this was not a feasible method, as the steel was very difficult to handle and puckered badly. We decided instead to create jigs to hold the steel in place while we secured the edges of each sheet to the trailer with aluminum flashing tape. We then secured the sheet metal to the timber framing with screws. After flashing the entire trailer, we installed rigid insulation in the lowered portion of the trailer where the battery bank and water storage tanks will be located. Kadim then covered the rigid insulation with a layer of OSB that the equipment will rest on. We installed fibrous insulation in the areas of the trailer where the raised floor system will accommodate under-floor storage. In the areas with no under-floor storage (kitchen, bathroom, closet zones), the flashing is on top of the trailer, where the raised floor system will be installed and insulated.